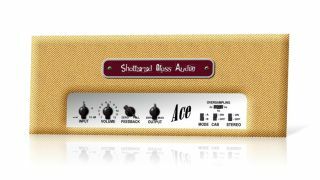 Shattered Glass Audio has freed the tweed and modelled classic valves to create Ace, an AU/VST/RTAS plugin amp simulator. In homage to classic 50s Fender tube amps, Ace also emulates common hardware mods, giving a Feedback control and recreating electronic tweaks to the sound. There's also an optional cab emulation and stereo mode, as well as two distortion flavours. What's not to like? Get it at the Shattered Glass website, and give them a donation while you're at it.